"Back in the Metal Again"! Well everyone it time for me to get back to my love for the Metal. I have been wanting to start working on this new line for a long time and I finally started getting it together. This is the first installment of my new "Trinkets & Tokens" metal line. This line gives me the chance to explore the use of simple shapes & delicate fretwork with decorative chains, beads and fun finding. I really like this line because I get to create beautiful pendants that are simple, yet unique. Keep Watching for new installments on this line in upcoming blog entries. 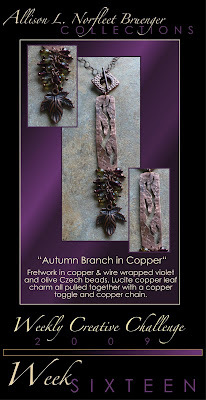 Also, I have updated my "What's New" page at www.alnbcollections.com with all of my upcoming shows. There are still a couple more shows I'm waiting to hear from. I will add those new dates to my site as the information becomes available. Take care and Keep Creating!! !